Skat developed short technical notes on water supply, sanitation and solid waste management interventions in schools primarily targeted to policy makers. The project aimed at providing easily understandable guidelines on interventions/technologies in the field of water supply, sanitation, and solid waste management in schools. The guidelines were primarily targeted to non-technical users such as government officers or school administrators. A series of guidelines on wind pumps, solar pumps, rainwater harvesting, groundwater recharge, ecological sanitation, greywater reuse, solid waste management, compost, solar cooking, school, gardening, and tree planting were produced. The basic information contained in the guidelines enables the readers to make a decision whether it is worthwhile to introduce such interventions/technologies in their specific context. 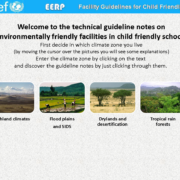 These guidelines have been integrated into UNICEF Environmental Education Resource Pack for child-friendly schools.